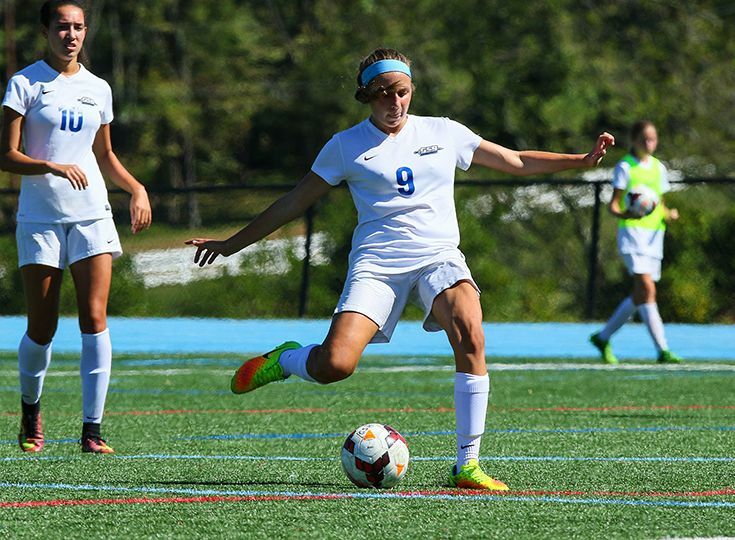 In recent years, the girls’ soccer team has grown into one of the top programs in the Skyland Conference and in the Non-Public B group, but the squad has fallen just short of its ultimate goal of winning championships. In 2014, the team made it all the way to the state sectional championship. Last fall, the Knights were a game away from claiming the Mountain Division title and fell in the Non-Public B semifinals for the second year in a row. While these are huge accomplishments that the program takes pride in, head coach Mike Williams and the players know that there is more they want to achieve. "We want to build on what we have done the last two or three years here," says Williams. "The initial stance is to finish in the top-three in the league and throw everything we have into winning the whole thing. Another goal is to take the next step in the state playoffs because once you are in the final anything can happen." The Knights will be missing big contributions from Ava Diggins '18 and Amelia Kirby '18. Williams, however, is confident that the leadership and teachings they left behind to a skilled underclass will help set a positive tone for the season. Seniors and 2nd Team All-Conference honorees Catelyn Woelfle '19 and Hayley Goldin '19 look to lead the way for GSB this year. The Knights should also get strong showings from juniors Alexandra Yates and Teresa Zimmer along with contributions from a strong freshman class. If the girls can play to their full potential then it could finally be the year that the program makes that championship leap. "It has definitely been tough to be so close and to be in the running the last couple of years," Williams said. "We have not quite been able to get over that hurdle but that is the main goal this year."